This is a sponsored conversation written by me on behalf of ReadyRefresh℠ by Nestlé®. The opinions and text are all mine. Party people!! I’ve been patiently waiting to tell you all about this for a few weeks now. Today is the day! My family filmed a Facebook video with ReadyRefresh and I am so thrilled to post it on my blog. WOOT! It’s all about the importance of family gatherings during the holidays. Spending time with family is literally one of the best parts of the holidays – whether it’s a quiet dinner at home or entertaining relatives. It’s something that I am so passionate about. In fact, during the holiday season, I host several parties for friends and family and I don’t mind one bit. It all ends somewhere around the third week of January. By then, I’m utterly exhausted but it’s all worth the effort because the memories my family and I make together last forever. Partnering with ReadyRefresh made perfect sense for me because I lean on them hard during the holidays to keep my family healthy and hydrated throughout the season. They help keep our hydration goals on track with a variety of options. We all know variety is the key to life and whether I need sparkling and flavored for Natalie or compact and still for Liam, I know it’s all included in my monthly delivery order. Drinking water and staying hydrated is vital to your body’s well-being and can help maintain concentration and alertness. But did you know that beverages account for 47% of added sugars in the U.S. American Diet and more than 13% of calories consumed per day? Simply replace a single 12-ounce, 140-calorie sugar-sweetened beverage with water each day for a year and you can cut more than 50,000 calories from your diet! Love that! As your bottled water supply dwindles, we begin to hoard those last few bottles for your kids, your spouse, or even just a thirstier moment – especially during the holidays when your list of to-dos is longer than ever. This is known as the Fear of Running Out or FORO. Well, thirsty choices aren’t always smart choices. I know personally I always grab what’s convenient when I am thirsty and not what’s best for me. That’s why it’s always important to have a great stock on hand and leave the sugary alternatives at the store… especially during the holiday season when eating and drinking habits can fluctuate. Avoid suffering from the Fear of Running Out—stay stocked on the beverages your family deserves with ReadyRefresh. So what kind of variety does ReadyRefresh include? 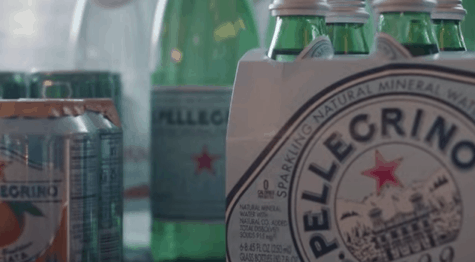 The customizable beverage delivery service provides your family with a variety of leading bottled water brands in assorted sizes and flavors like RSW (still and sparkling), Nestlé Pure Life, Perrier, S.Pellegrino, and Acqua Panna. There’s something for everyone in the family! Simply choose what products you’d like in your order and your frequency options (choose weekly, biweekly, monthly, bimonthly, every 3 months or even one-time ordering). Place your Order with ReadyRefresh today and receive up to $50 off your first order as well as free delivery! The holidays can be a stressful time and the last thing you want to worry about is running out of your supply of beverage options. With ReadyRefresh, avoid the Fear of Running Out and keep your family’s healthy hydration on track throughout the holiday season and beyond. Did you watch the video? What do you think? Would love to know how you stay hydrated during this time of the year. Join the conversation on Facebook and Twitter using #NoMoreFORO. This is a sponsored conversation written by me on behalf of ReadyRefresh by Nestlé®. The opinions and text are all mine. I have not heard about Ready Refresh until now. I think this is a great idea for some people who do not like to drink plain water. Although I have no issues with downing a glass of water, this is still something I would love to have for my family. The video is really cute, I’m the party planner in our home. Because I’m also OCD I don’t like help. Stocking water in our home is always a chore. My son does a lot of spots and so it doesn’t last. At this very moment, we are down to two bottles and I need to go to the store. Delivery would fix all of that for me. Dehydration can certainly creep up on you if you aren’t careful! Having water always readily available for my kids is very important to me.